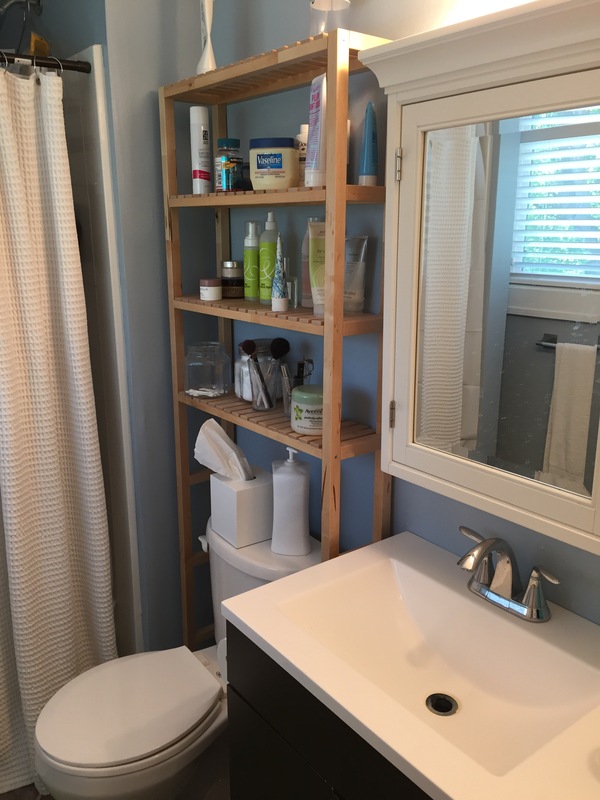 Our master bathroom is short on storage and long on annoyances. For example, the heated tile floors that seemed like a real selling point have never worked. Not once. And to make up for the lack of storage, some sharp tack installed the vanity so that its drawers can’t be opened more than halfway before running into the room’s door frame. 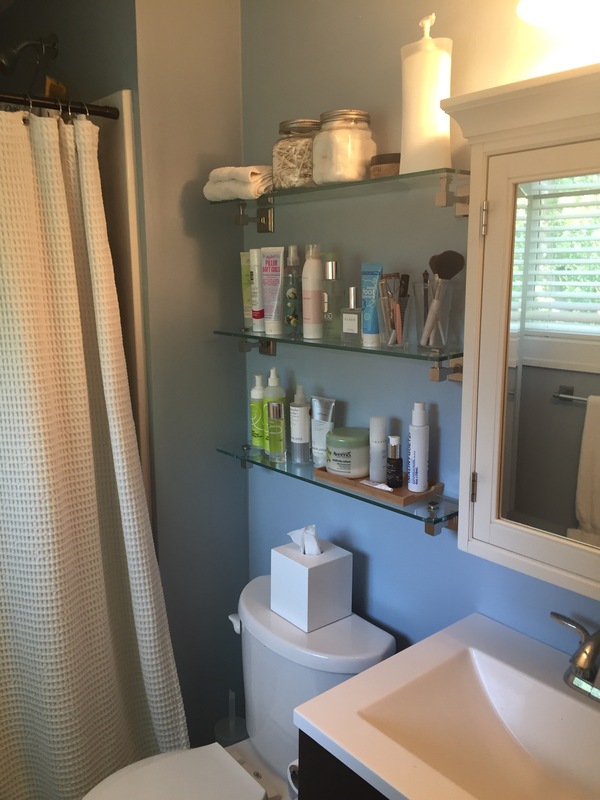 And there was no medicine cabinet – just a mirror – because why add storage when you don’t need to. I mean, the house has a closet somewhere. Anyway, one thing the room did have was a couple of those nice looking “floating” shelves and they were hung above the toilet. But as soon as we tried to use them, we discovered that they weren’t hung well and wouldn’t really hold anything up. You know, which isn’t that cool if that’s what you’re interested in having a shelf do. So AO took them down and that’s when things made sense. The shelves weren’t there to hold things, but to cover up what may have been the scene of a murder. Someone had done a lot of damage to that wall; there were holes everywhere. But a lot of patching and sanding and painting later (all by AO), we had a clean, storage-less wall. Now what? We didn’t want to spend a lot of money because the dream was that we’d someday expand the room (and maybe get those floors to warm up) so after a trip to Ikea to solve all of our other problems, we came up with this beauty. But lately AO and I have been on kinda a tear about all-things-wrong-with-our-house and this one was on my list. I also thought it might be contributing to my hostility to showering. So, for the greater good of those around me during this humid summer, I was determined to fix it and by “fix it,” I mean I was determined to order something for AO to install. But preferably not without me messing it up at least once so that he could get sufficiently annoyed with me before saving the day. It’s just not fun otherwise. And guess what?! Missions accomplished! I found some seriously marked-down shelves from Pottery Barn, ordered them, tried to install them myself, put a nasty hole in the wall and it was almost like we were right back to where we started two years ago! Only now I’m in my 40s with epilepsy! #goodtimes Anyway, AO rescued the operation (swoon!) and I think we can all agree we have a cleaner (if still imperfect) looking bathroom. Omg it’s gorgeous. Love. Love. Love. We need to do this to our bathroom!